PARIS -- A Friday evening in Paris. A Friday the 13th that brought us no luck at all. Everyone is looking for somewhere to eat. Parisians are out on the town. Like us. My husband and I are looking for a restaurant. We think about going to the Petit Cambodge, where, like many others, we often have dinner. Then we pass by Bastille. It's 9 p.m. We pause by the Belle Equipe, at the corner of Faidherbe Street; the terrace was totally packed. We hesitate: there are too many people. I think to myself this place looks good. People are smoking and laughing out on the terrace. It's totally packed. An hour later they will be shot. We end up in a little restaurant on St. Bernard Street, parallel to the St. Antoine neighborhood. Everything's going well...At 10 p.m., the owner gets a phone call. "I'm going to have to close the restaurant; there's been a terrible attack a few meters away!" My body starts to shake, I don't get it, I remain frozen, until my husband yells: "A woman covered in blood just walked by on the street!" My husband and the owner of the restaurant panic and hurry to close the wooden shutters of the little Italian restaurant. I'm scared, and I remain frozen. We hear sirens everywhere, gunshots on the street. It starts up again. People are knocking on the door: they're asking us for asylum. We open the doors and let them in. About 10 of us are huddled up inside this little restaurant. I go down to the basement. We stay there for six hours. Some people are eating and talking, until we're told that the attacks have resumed, very close by. We must turn off all the lights and be quiet. In the dark, by candlelight, we try to knock back tumblers of strong drinks, but nothing seems to help us forget that we're not safe, and that a few hundred meters away from us, people have just died. Such a familiar environment becomes foreign and terrifying. I feel trapped in this place, in the thick of it all. Cellphones aren't working well. Parisians our age often visit and roam these streets. Everyone is sending us messages: "Let me know that you're safe." That's it, they've won: panic takes told of us. I hate feeling unsafe in my own country, in my city, my city that has descended into chaos within a few hours-- my city, where innocent people sitting on a restaurant terrace one Friday evening have just been shot. This feeling that it could happen anywhere and at any moment, on any terrace, in any neighborhood. In an effort to reassure my family in the south of France, we try to find a solution, so that we wouldn't spend the night in the restaurant. It's midnight. I'm so scared, I don't know what's happening outside. I imagine the worst, worse than the worst, I think of my friends. Huddled up in the basement, we receive several bits of news, each one more frightening that the one before. Everyone is starting to talk nonsense. I ask my mother to turn on BFM, to find out what's happening right above our heads. I think it's going to take us a lot of time and a great deal of help to get back on our feet, and learn to live normally in Paris once again. At 1 a.m., we decide to leave the area, overcome with fear. 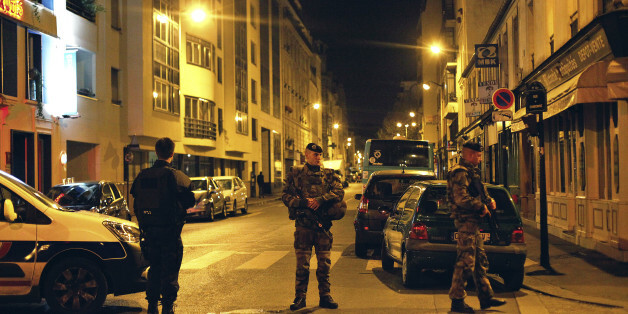 We hear, on the radio and on our cellphones, that they're launching attacks at the Bataclan concert hall. We decide to leave. We take every one-way street to go faster, and head to my cousin's house, 500 meters away. We can't go home to Republique, there's police everywhere.